Rising from the underground, DJ S.K.T’s sound has gained support across the board, including Radio 1/1xtra DJs such as Annie Mac, Pete Tong and DJ Target to producers like MK and Amine Edge. With previous releases on Strictly Rhythm, Audio Rehab, FFRR and Ministry of Sound, he now drops ‘Take Me Away’ alongside Rae on the revived Azuli imprint. DJ S.K.T’s productions and Rae’s vocal fit in well with the current wave of garage-influenced house tracks that are playing a huge part in the club scene, particularly in the UK. 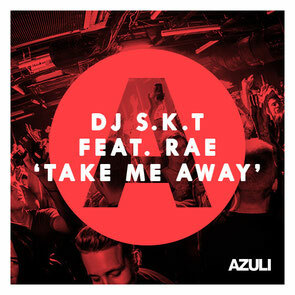 ‘Take Me Away’ is top bassline-lead house, with Rae's atmospheric vocal combining with hard-hitting production. It’s out 23 March, check it out below. Thank you, I've recently been searching for info about this topic for ages and yours is the greatest I have found out till now. But, what in regards to the bottom line? Are you sure about the source?